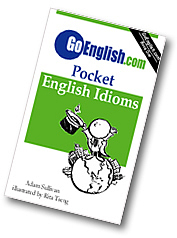 Today's Idiom = "Its Anyone's Call"
To "call" something here means to make a decision about it. In a sport such as baseball a referee is the person whose job is to "make the call" in any particular situation. When the play is so close that we can't be sure what the correct call should be, we say it is "anyone's call". To say it is "anyone's call" is to say that no one person's information is better than any other person's. Example: "Who do you think will win this election?" Answer: "Its anyone's call."